Marion had spent the first 7 years of her life in Somerset, before the family moved to Charvil. Here they lived opposite Gingell's Farm - where a donkey was the substitute for the horse she had always wanted! Summers were spent on and around the Thames. When Marion was 14, the family moved to Wargrave. She would travel to Sonning for the Guides, and sang in the choir at St Andrews. She also had a paper round - there were so many papers for The Manor that those alone filled one delivery bag! On leaving school, she joined the Midland Bank in Henley - rather 'traditional'. The manager at the time still wore spats, and she was the first female member of staff there. She cycled daily from Wargrave - to do so then was not considered the hazard it would be now. Her tasks including preparing customer statements - all done by hand - and taking old bank notes to the Post Office, following the same route every day! In due course she progressed to the front counter, and also the foreign desk, working for a total of 5 years at the bank. The A4 was lined by poplar trees at that time, and as she made her way to and fro, a young man would stand and whistle at her. He had the task of delivering letters for his sister, Mary, then secretary of the Tennis Club, and asked for Marion's help - which led to them going courting. Michael was involved with the local football club -- a somewhat sweaty group crowded into Billy Kent's old bus after a match - and Marion would wash the team shirts 'in the name of love' !! They were married in 1959, with a reception at the George and Dragon, and then lived in Braybrooke Road. They had three children - Chris, Nick and Katy - Nurse Woods visiting by bicycle - before they moved to a house built by Michael's grandfather in East View Road. Neither of roads was properly surfaced then. Marion worked as an 'auxiliary postman' in her younger days. Delivering the post to houses down Loddon Drive would sometimes involve using a punt - and even then the post may have to be left at Channings, as further progress was too difficult. It was about this time that Derek and Nigel Hannen invited Marion to become a trustee for the Scouts in Wargrave. This was the start of a long involvement with Scouting in the village She remained a trustee until 1969, and from 1972 was one of the Cub Scout Leaders. This would involve various fund raising activities, such as jumble sales, plant sales, or waste paper collection (before the days of council 'recycling'), and regular camps with the boys. At first the Cubs camped in Bowsey Wood - where one of the tasks was to find the Bowsey bear - they never did! - and later camps were at Park Place. Summer holidays were usually a two week Scout camp. Buddy Rose would choose the sites - usually 'challenging' and not always on the level. When the Scouts became more 'river based', they made the canoes using much resin and fibreglass. 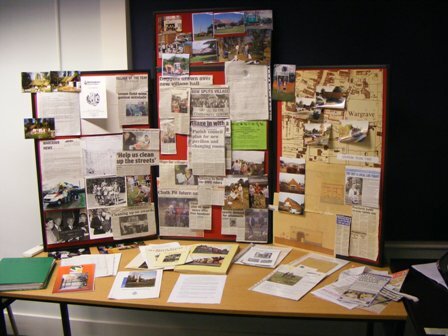 In the 1980s, fund raising included the Scout marquee hire, whilst there were also District Gang Shows to prepare for. Other 'village activities' included the Rhubarb Thrashing and Marrow Dangling competitions - held in the car park of the Greyhound. There would also be a weekend of events at the Recreation Ground. The village sports clubs formed a joint committee for a sports day (organised by Adrian Downton, then Headmaster of the junior school) and a Village Produce Show would be held at the Scout Hut (these weekends pre-dating the Village Festival by several years). Mary Halliday ran pottery classes in the early 1960s - Marion still has what maybe 'the heaviest coffee set in the world'. Michael and Marion also made their own boat, from 6 mil ply, fitted with leather seats. It was taken far and wide - including to the Gower, in south Wales, and to Scotland. They also tried making their own beer - although after a brewing explosion, settled on wine making instead! When the primary schools formed a PTA, Marion became actively involved. Bazaars and summer fetes were used to raise funds, so that the swimming pool and changing rooms could be built on the infant school site. On one occasion when it was feared there was a leak in the pool, the volunteers of the PTA set about emptying the pool by bucket - until the fire brigade were summoned, and pumped it out easily -- and there was no leak! From lollipop lady to chairman of the infant school governors, Marion recounted various stories - from sleeping governors to trips to Ufton Nervet, or the Katesgrove Victorian school. Marion was elected to the Wargrave Parish Council in the mid 1970s - as an 'independent'. In 1977, she took on the booking of allotments - still a popular parish facility (for which a centenary party was held in 2003). How best to make use of the chalk pit became a recurrent issue - the representatives of Henry Bond who had given the land to the village being against any development, and several planning applications were rejected. Eventually - in 2009 - the area was acquired by the Parish Council for a village amenity area. Following the death of Bob Gray in 1993, Marion became Chairman of the Parish Council. The next year, the Council acquired the field now known as 'Kings Field' from Lord Remnant, as a Recreation Ground extension, and then in 1995 helped the formation of the Pop-In Club for the older residents of the village, whilst more recently the Council had facilitated the provision of 'affordable homes' at Kings Acre. Road safety work fought for by the Parish Council included getting improvements to the A4/Mumberry Hill junction, provision of safer routes to the junior school, and refurbishing the footbridge over the A4 for Piggott School children. The village several times won the prize for villages of over 3000 people in the 'Best Kept Village' competition. The later Calor Village of the Year also saw Wargrave winning 2 prizes. No doubt the annual 'litter clear up' weekend (on 24th March in 2012) helped Wargrave win! Not everything was 'positive', as the plans for a Millennium Bridge over the Thames and for a Leisure Centre for the village came to nothing, whilst other incidents that Marion recalled were the fire at the Scout Hut in the mid 1970s, the fire that damaged the Youth Centre in 2004 and the fire that destroyed the tennis club building at Easter 2009. Fortunately, all were rebuilt. Marion also recalled that the village had started collections for the 'Feed the Children' charity, and the work of the Wargrave 'Relief In Need' charity. Whilst collecting for the Poppy Appeal at (then) Kennedy's Garden Centre early of a cold Saturday morning revealed that few people went shopping there at that hour! Marion also had been involved with the Wargrave Bowls Club and St Mary's Church, whilst her 'family memories' included the achievements of her children - she was clearly very proud of them all! 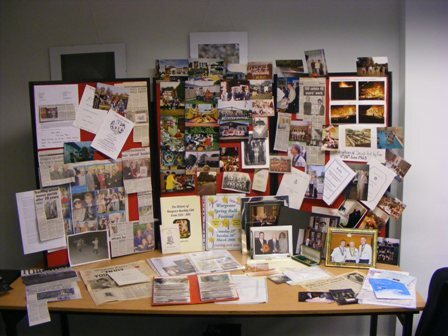 The audience were also able to study a fascinating display of newspaper cuttings photographs, and other ephemera that Marion had prepared to illustrate many of the people and events that she recalled. The next meeting takes place on Tuesday, March 13th, when the Society will hold its Annual General Meeting, and announce the programme for the coming year. The meetings start at 8pm in the Pavilion, on the Recreation Ground.